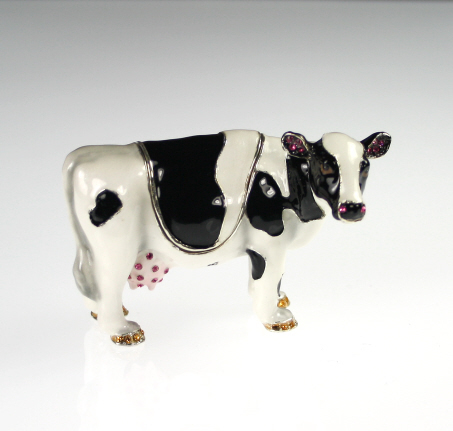 Smart Friesian Cow Trinket Box with black and white enamelling, encrusted with pink and gold Austrian crystals. Inside the hidden compartment is a replica miniature cameo friesian cow necklace. From the 'Hidden Treasures' award winning range. A pair of black and white enamelled cow cufflinks. Great novelty cufflinks for dairy farmers! A beautiful frieisan cow mug and coaster set with an attractive country scene. A silk cow tie with Hereford, Friesian and Jersey cow breeds on an olive green background. Great gift for cattle breeders and dairy farmers!